Middlesex’s Eoin Morgan is in pole position in the chase for this year’s Walter Lawrence Trophy, awarded for the fastest hundred of the season, with a 49-ball century. England’s mercurial Dubliner hammered 9 sixes and 6 fours in his hundred, helping his side crush Lancashire by 167 runs in the Clydesdale Bank 40 match at Lord’s on June 10. The 25-year-old one-day specialist shared a third-wicket partnership of 126 in 10.5 sizzling overs with fellow Irishman Paul Stirling, who also made a century. Morgan has represented England in 16 Tests and over 100 limited-over Internationals, and will be a key player in the T20 World Cup later this year in Sri Lanka. Now in its 78th year, the Walter Lawrence Trophy is open to all domestic county competitions as well as One-Day Internationals, Twenty20 Internationals and Test Matches in England. The winner of this year’s Walter Lawrence MCC Universities Award is Oxford MCCU’s Freddie Coleman. The 20-year-old Scot scored 141 against Durham MCCU at The Racecourse on April 28, hitting 14 fours and 1 six in his innings, which was scored off 275 balls. 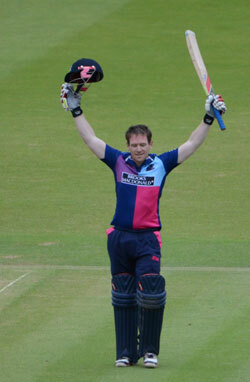 Coleman is the first Oxford player to win the Award, which is for the highest scorer in an innings played against one of the other five MCCUs or against one of the first-class counties, and the seventh recipient since its inception. The Edinburgh-born batsman, who has represented his country at all levels and has also played for Warwickshire 2nd XI this season, will receive a silver medallion and prize of £1,000 at the Walter Lawrence Trophy presentation dinner in The Long Room at Lord’s in October. This season the trustees of the Walter Lawrence Trophy, supported by Veuve Clicquot, are delighted to announce the launch of a new award for the women’s game. The award will go to the batsman who makes the highest individual score in a season from the ECB Women’s County Championship, the ECB Women’s County T20 Cup and all England Women’s matches played on home soil. The winner will receive a cheque for £1,000 as well as an engraved silver medallion and an invitation to the traditional Walter Lawrence Trophy end-of-season presentation dinner in the Long Room at Lord’s. Charlotte Horton has set a stunning target in the Walter Lawrence Women’s Award with an unbeaten 177 for Derbyshire Women against Northamptonshire Women. The 26-year-old opener hit 28 fours and 1 six in her innings, scored off 157 balls, helping her side to an 83-run victory in the LV Women’s County Championship, Division Three, match at Derby on May 6. This new initiative completes a quartet of Walter Lawrence Trophy awards, supported by Veuve Clicquot, which encompass four distinct areas of the game: the Walter Lawrence Trophy, for the fastest century of the season; the MCC Universities award for the highest score by a batsman from the six MCC Universities against the first-class counties or in the MCCU Championship, and the Walter Lawrence Schools Award launched last season for the highest score by a school batsman against MCC.